The more you praise your child, the more self esteem your child will have. This is correct, isn’t it? Kids have a way of knowing if they have truly earned your acclaim or if you are manipulating them. Example: your unrealistic praise is way out of line. Your child knows he is not that good. He wonders what you want or discounts much of your praise as being ridiculous. Self-esteem is built by realistic praise. Remember, children know when praise is not realistic. Example: to cheer your daughter on, you don’t mention the difficulties (or much of the truth) about her performance in soccer. She does not make the team and is crushed out of proportion primarily because you told her there was nothing to making the team. 1. Explain that your child has done well and can do even better next time. 2. Don’t answer a statement of dissatisfaction with praise. Instead, acknowledge the feelings shown and help your child plan for a better performance next time. Remember that the best praise for your children is praising their own judgement. Of course, that can’t always happen. Sometimes their judgment, or society’s judgment as mirrored in their eyes, is not the best action or accomplishment to praise. Example: your six-year-old daughter spends much too much time in front of a mirror. She’s cute. You know it and she knows it. 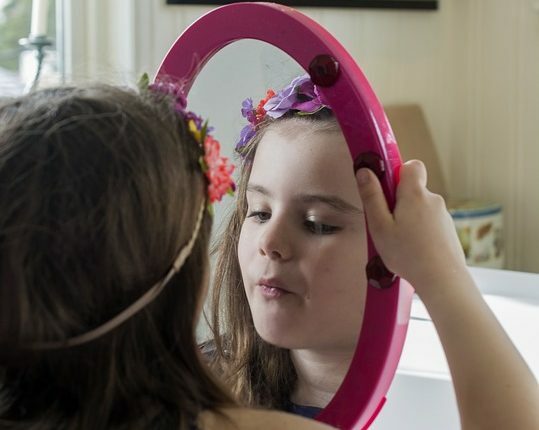 However, the mirror needs a rest and your daughter certainly needs to know there is more to life than appearance. Yet your daughter and all children need to know their looks are acceptable. So what do you say when you find your daughter staring away at her reflection?